Lee Hart and his deaf brother Ned are left alone when their father disappears and their mother dies. Things start to turn around when Lee gets an apprenticeship at the local funeral parlour and falls for a beautiful florist. It's a moving story, of lovel, loss and family with engaging characters and a nice sense of humour to balance out the sadness. 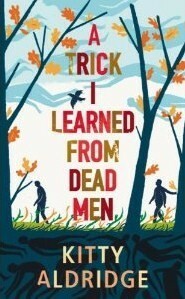 A Trick I learned from Dead Men by Kitty Aldridge published by Vintage Books.